Location: “Holiday – SPA & Wellness” is a comfortable and modern hotel, situated in the heart of the SPA capital of the Balkans – Velingrad. The lake Cleptusa, which is the biggest cavernwater spring in Bulgaria, is located nearby the hotel. 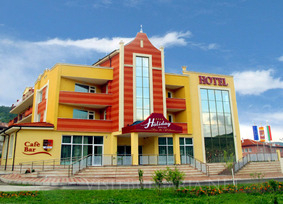 Accommodation: All rooms available in the hotel are spacious and comfortable, with a bathroom with bathtub. The hotel offers 13 twin rooms with twin beds, with a possibility for an extra bed, and one of the room is adapted for disabled people and it is up to the requirements of generally accessible environment. 8 Double deluxe rooms with double bed and a possibility for an extra bed. Holiday Spa & Wellness Hotel also offers 2 Studio Superior, 2 Apartments Superior and 1 VIP apartment – maisonette. Wine & Dine: The various restaurants and bars are the favorite place for the hotel guests, where the day begins and ends before you can even enjoy the pleasant atmosphere and the perfectly prepared drinks and dishes. The SPA and Wellness center: is a place, where the healthy procedures and pleasant feelings are combined successfully. It is a place where you can relax and enjoy all the SPA activities in a new atmosphere. The unique spa center is one of the most desired hotel place for visiting. Our spa center is divided in 3 parts, where we can make your body and face irresistibly beautiful and attractive. Conference and meeting facilities: At your service is a specialized conference room with 30 places cinema type arranged, or 15 oval arranged places for business meetings, equipped with high speed internet, multimedia and audio with wide panoramic view, which brings space and light.